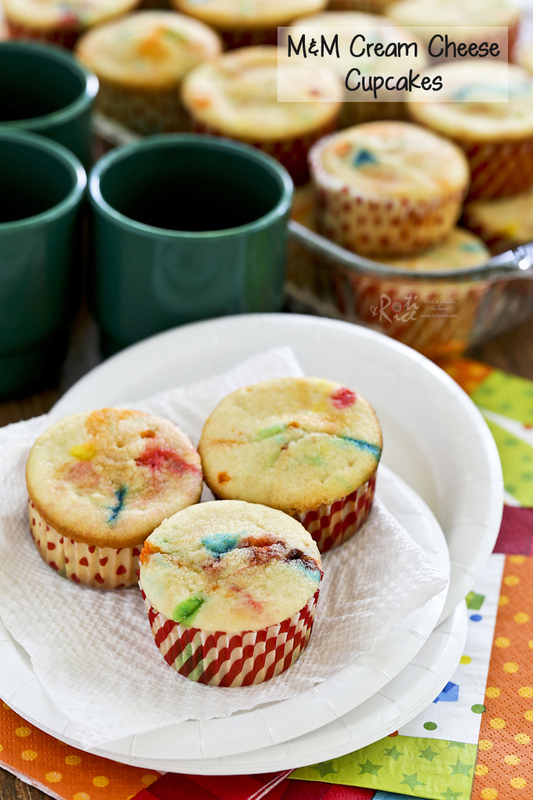 These bright, fun, and easy M&M Cream Cheese Cupcakes are perfect as a lunchbox treat or an after school snack. Frosting is totally optional. It is that time of the year again for Vacation Bible School at our church. Last year I helped out in the kitchen preparing snacks and so I decided to do the same this year. It was a busy but fun week working with the three other volunteers in the kitchen. Our team leader was very creative and we prepared popcorn “torch”, snack mix, fruit kabobs, celery “locusts”, and rice krispie “crowns” for the kids. The week went by quickly and today was the last day with an appreciation lunch for all the volunteers. We also prepared snacks for the bible school teachers and our energetic youth helpers. Last year I made a bunch of cookies – Soft Chewy M&M Cookies, Coconut Pecan Cookies, Sugar Cookies, and Checkerboard Cookies. This year we have a lot more snacks and so I kept it simple and made only these bright, fun, and easy M&M Cream Cheese Cupcakes. I made these late in the evening and left them plain without any frosting but you can certainly make a simple butter cream or cream cheese frosting to pipe on the top. I think a white colored frosting studded with some M&M candy would be pretty. Using my Raspberry Swirl Cream Cheese Pound Cake as a guide, I more or less doubled that recipe with minor adjustments on the number of eggs and the amount of milk used. I had sufficient batter to make 30 cupcakes which was perfect because I had two 12 cups and one 6 cups muffin pans. Any more batter and I would have run out of muffin pans. 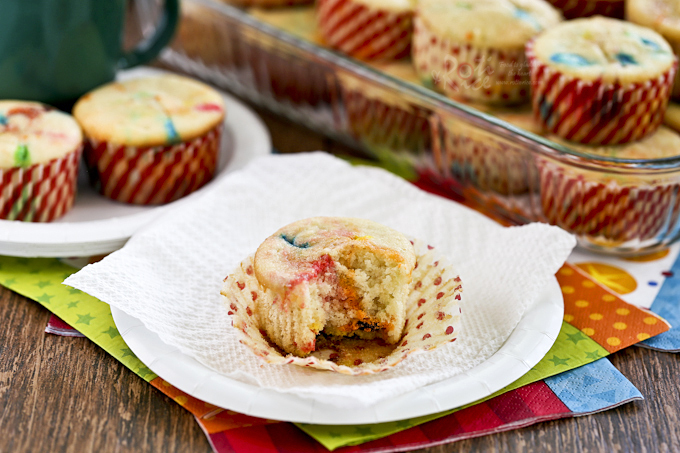 This time round I used M&M semi sweet dark chocolate baking bits I found at Walmart. They are similar in size to the regular M&Ms. 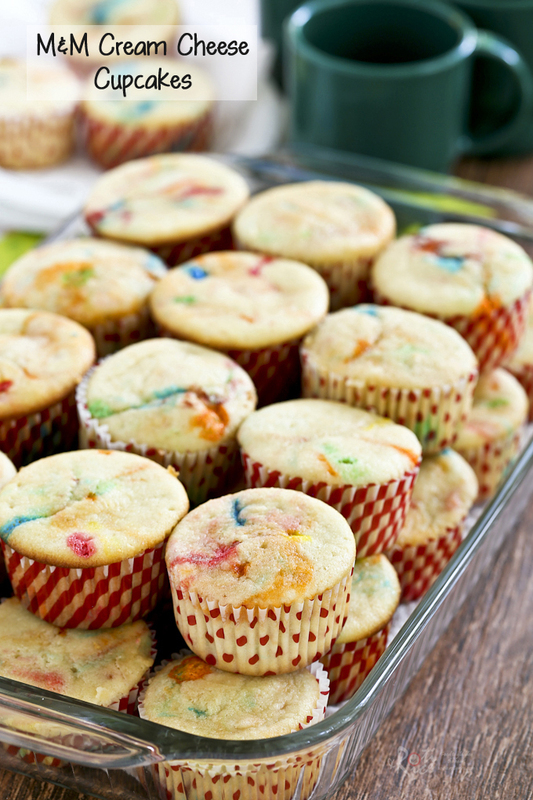 I mixed one cup of the candy into the batter and place the remainder on the top of each cupcake. 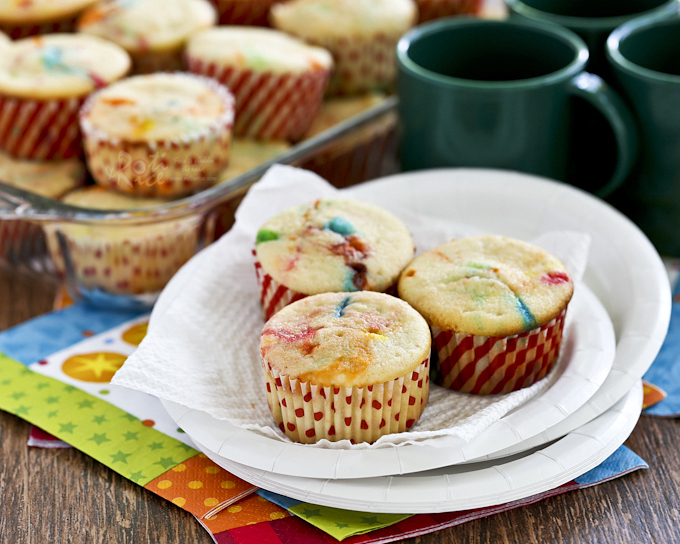 The coating melted away in the oven causing the pretty striation of colors in the cupcakes. It would have been even nicer if some would remain whole but it is what it is. I guess the only way to achieve that is to use frosting but the decision to frost or not to frost is totally up to you. Preheat the oven to 350°F (180°C). Line two 12 cups and one 6 cups muffin/cupcake pans with cupcake liners. Sift all-purpose flour, baking powder, and salt into a medium sized bowl. Cream butter, cream cheese, and sugar in a large bowl until light and fluffy, about 2 minutes. Add vanilla extract and beat for 30 seconds. Add half the milk and half of the flour mixture. Beat on low speed. Then add remaining milk and flour mixture. Continue to beat until combine. Fold in 1 cup (200g) M&M semi sweet dark chocolate baking bits. Fill cupcake liners until about 2/3 full. 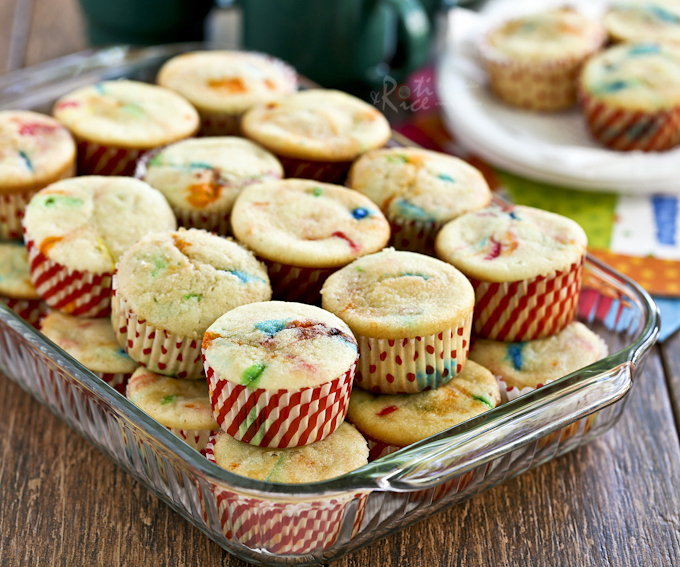 Place remaining M&Ms on the tops of each cupcake batter. Bake for 20 minutes or until a tester inserted in the center of the cakes comes out clean. Cool cupcakes in pan for 10 minutes, then remove and cool on a rack.